Mastery: Sewing Basics Part 1 & 2 - B880 Plus, 790 Plus, 770QE, 740, 590, Next Gen 570 QE, 535, 480, 475, and 435. Learn the basic operations of the machine with practical and decorative stitches. Mastery: Embroidery Basics Part 1 & 2 - B880 Plus, 790 Plus, 770QEE, 700, 590, Next Gen 570 QE, 535, and 500 Embroidery Machines. Learn the basics of how to use your embroidery machine. Learn the basic operations of the machine with practical stitches. Customers who purchase a machine from Cupcake Quilts are welcome to attend our Free Mastery classes, If you’ve purchased a machine elsewhere, you can attend at a fee of $25.00 an hour. With two locations to serve you it is possible to complete all your classes within a month! Classes will be offered every month but we will rotate the days of the week to be able to accommodate everyone's schedule. Be sure to reserve your space for Mastery class by calling the location of your choice. You will be required to bring your own machine to each class. If you have just a few questions about specific functions on your machine, or have an older model, please call to set up a one on one appointment. 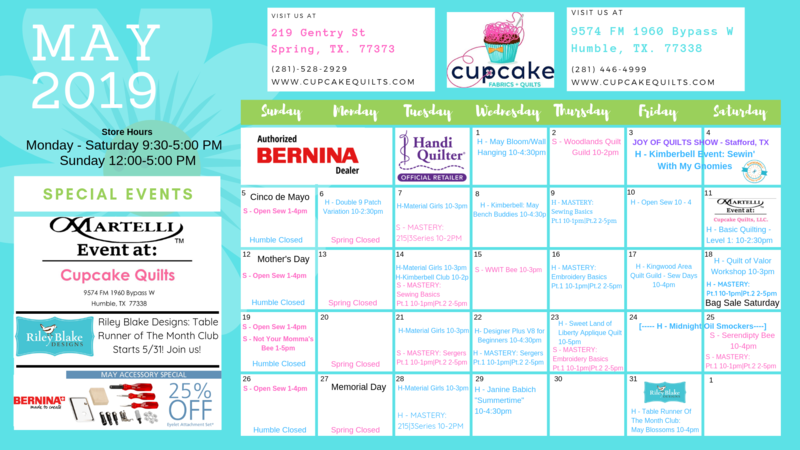 Humble Event: Martelli Cutting Systems comes to Cupcake! DUE TO IMPENDING WEATHER WE ARE RESCHEDULING TO MAY 11, 2019 Martelli Cutting Systems will be here to demo their products for our customers! Quilters come in all shapes and sizes. Are you tired of your back aching every time you lean over the cutting table? Are you standing on your tippy toes to get the perfect cut? Martelli will bring their Electronic Adjustable Cutting Table that adjusts from 30" to 46" with the touch of a button. Come touch and see! Try before you buy! Their patented No Slip Rulers will be here to aid in learning new tips, tricks and techniques. They will demo other products as well AND it's our boss' birthday sale! Join us for Claudia's newest workshop-only pattern, A Child is Born! It is as inspiring as it is full of spiritual wonder. Enjoy the vast expanse of stars in the sky and the traditional elements in every beautiful Nativity. Angels on High, Little Town of Bethlehem, the Wise Men, Shepherds and, of course the baby Jesus, Mary and Joseph. Plus a lamb or two. Workshop is designed for the experienced beginner, intermediate, and advanced students. Students will master Claudia's multi-hooping technique for perfect placement and alignment. Improve hooping skills; better understand the features on your machine that allow you to tweak the position of a design within the hoop. You will also get tips and techniques to help keep your embroidery flat, fun, and flawless! Remember this pattern is only available at the 2 day workshop! This Class is filling quickly! Class size is limited. The cold weather is gone! The birds are singing and the flowers are growing. No longer do we have to look at brown grass and barren trees. Houston is alive with color! Celebrate the Spring Season with this adorable BLOOM wall/door hanging. The bright festive colors on the pieced top and bottom borders will make you smile. No embroidery machine needed � this project is 100% applique. Be creative and add a few of your favorite insect buttons � a worm, a lady bug, or perhaps a bee. Signup to receive specials, new items, and more!